Daniel Sturgis “Passion and Distance”. 2008, acrylic oncanvas. 163x214cm. 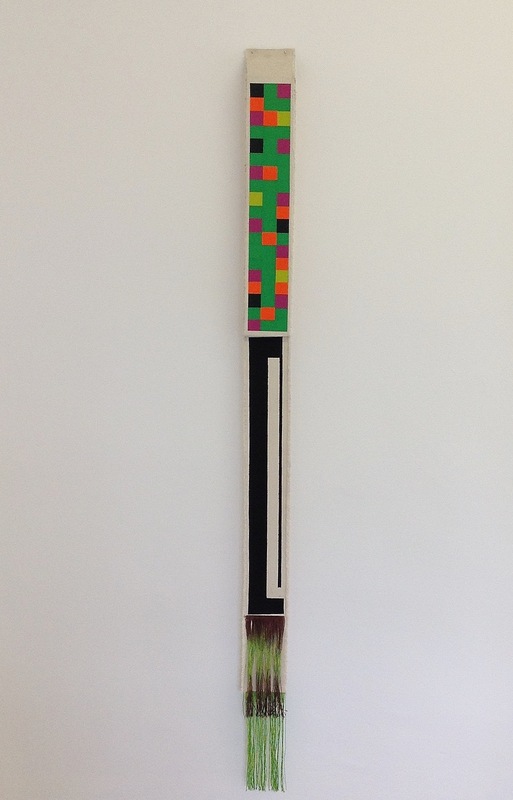 Daniel Sturgis’ paintings seem to play directly on the optical buzz of Minimalism’s thrill seeking cousin Op Art. Op received a serious mangling by the likes of Ross Bleckner in the 80s. He filled Bridget Riley’s stripes with failure and death via nostalgia and Gothy kitsch in his appropriations of Op. Sturgis seems to set up skewed chess board- like and playful (if not at times wistful) visual paradoxical games with it. One can’t help for example of seeing the 2 red dots in ‘Passion and Distance’ 2008 as balls or marble like characters poised almost melodramatically on slopes of off-kilter pinky orange and murky green or yellow cliffs. A thrust and parry of camp flourishes, dead spaces and arch references haunt this work. James Campion. “Window Eleven”, 2017, oil and copper leaf on canvas. 119X184cm; and “Window Twelve”, 2017, oil and copper leaf on canvas, 119X92cm. James Campion’s work seems to look more directly to Halley or maybe to Robyn Denny? And this difference could be important. Denny translates the languages of hard edge and field painting in a late modernist surge of optimism for the future. Halley uses a very similar vocabulary to question why that future never really arrived. Rather than ‘conduits and cells’ though, Campion gives us fine lines of copper leaf that act like hot wires on circuit boards taking our eyes around the paintings’ edges. 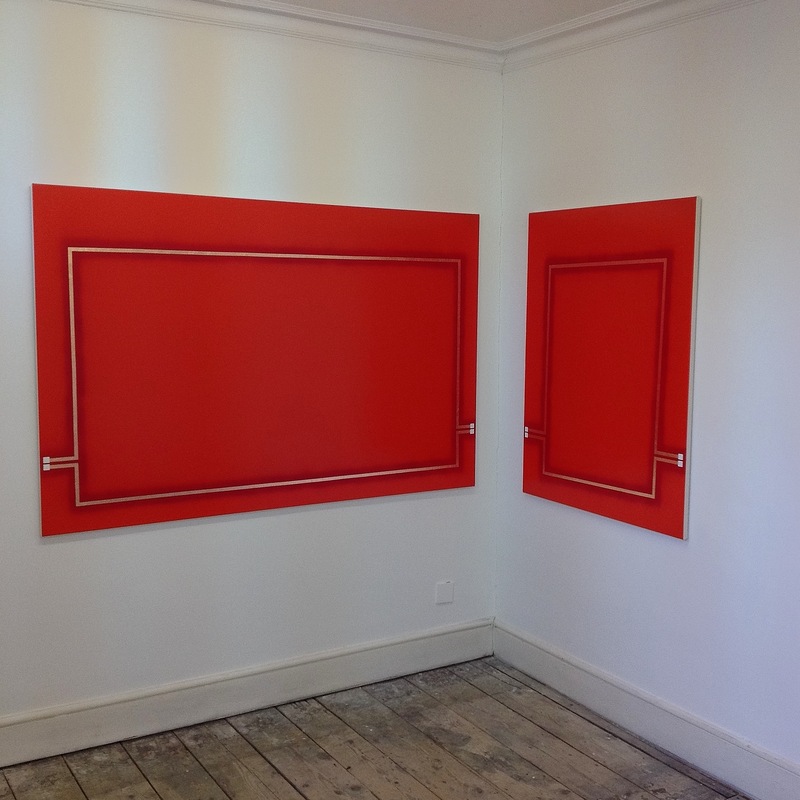 These red monochromes lean in on each other, set as they are on the two walls of a corner; they echo and amplify each other’s electrical fizz. All heated up by beautifully crafted and worked surfaces they throb and intensify at their stretcher’s edges. One could almost warm one’s hands by them. Mali Morris, “Among Days.”,1997, acrylic on canvas, 171x197cm. 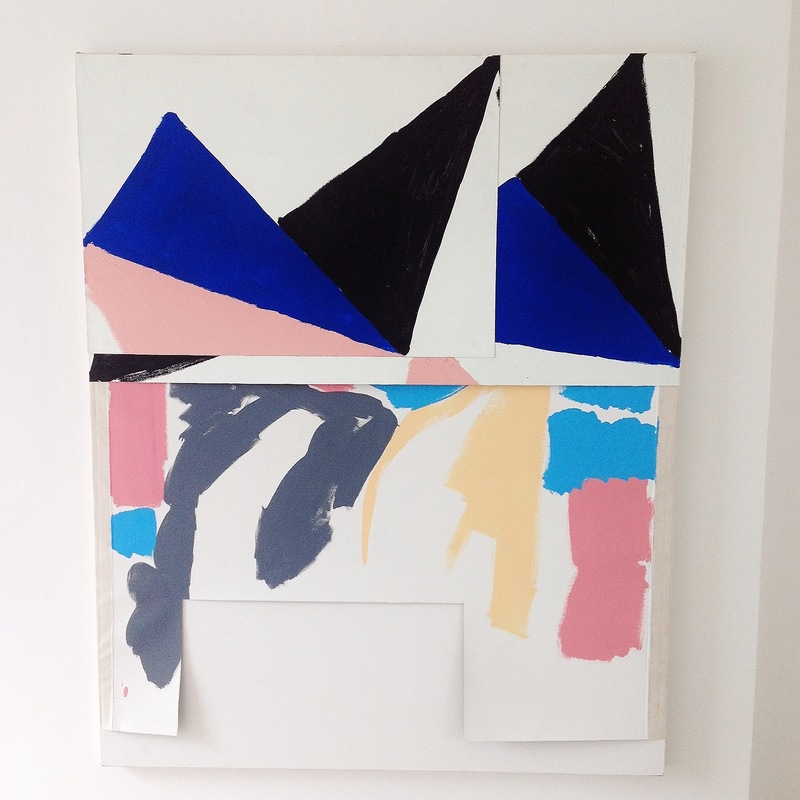 Mali Morris, “Dark Ashbery”, 2013, acrylic on board, 24X28cm. Mali Morris intimates the grid but in an altogether different way. ‘Among Days’ 1997 is a knotted pulsating black central form built up of translucent washed out brush marks that squirm unsettlingly before the eyes. But this riveting central image with its disturbing upper central dark spot opens up against quietly orchestrated lime brushmarks that are set at near regular intervals. They suggest both a pulsing grid but at the same time, with an uncanny incongruity, a ghostly lime green brick wall. And they are strokes in the true sense of the word, delicate but precise, notional but persistent. 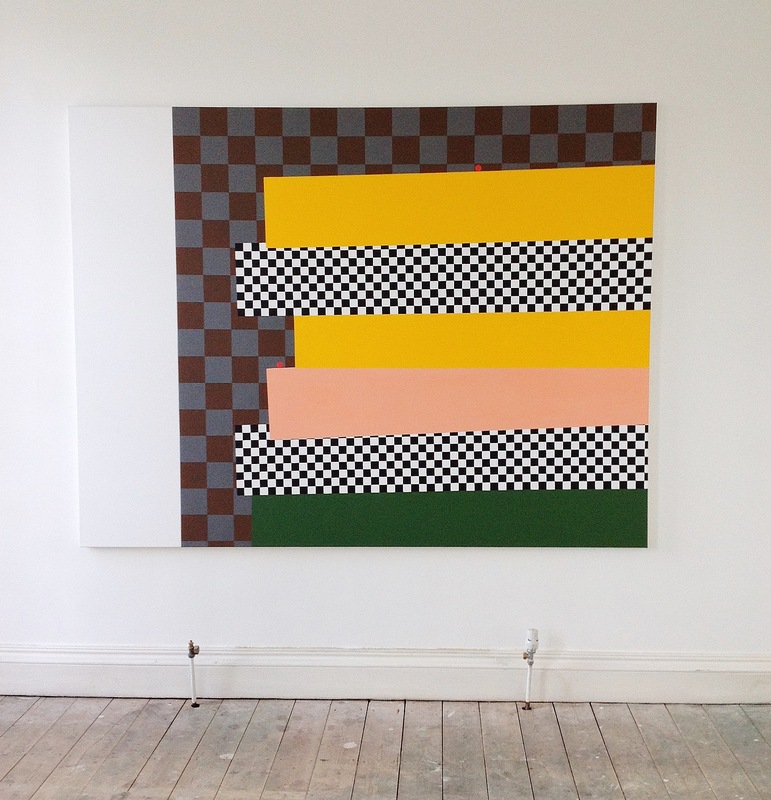 Morris calls up the grid once more in the small painting ‘Dark Ashbery’ 2013. But here she has melted right angles into translucent and glowing criss-crosses of vibrantly coloured brush strokes. 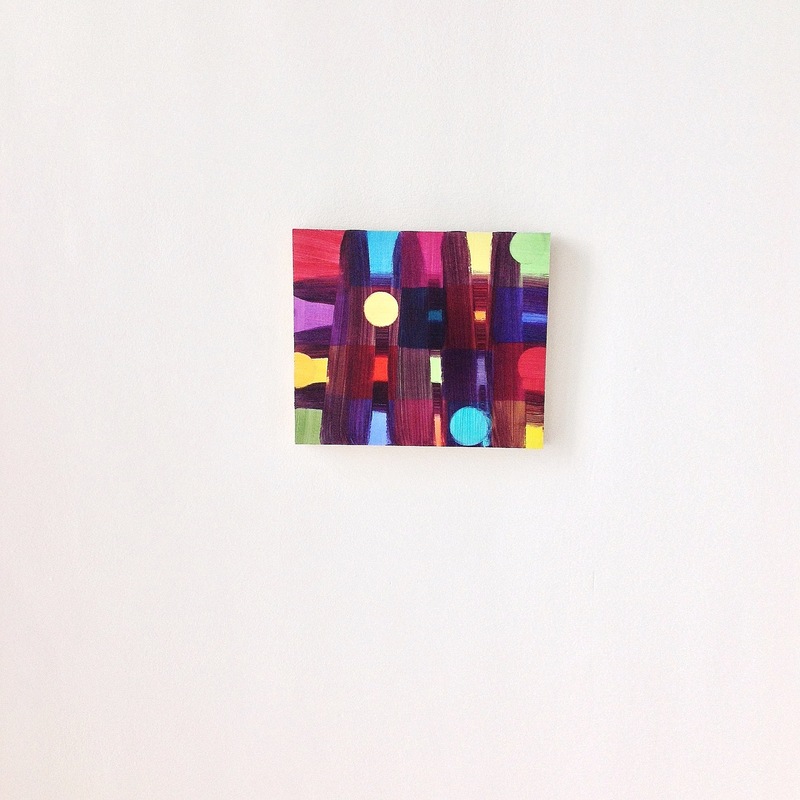 They are punctuated by cleverly orchestrated circles or dots that phrase her colour rhythms in intervals of blood reds, luminous limes, sunny yellows and cooler glassy blues. 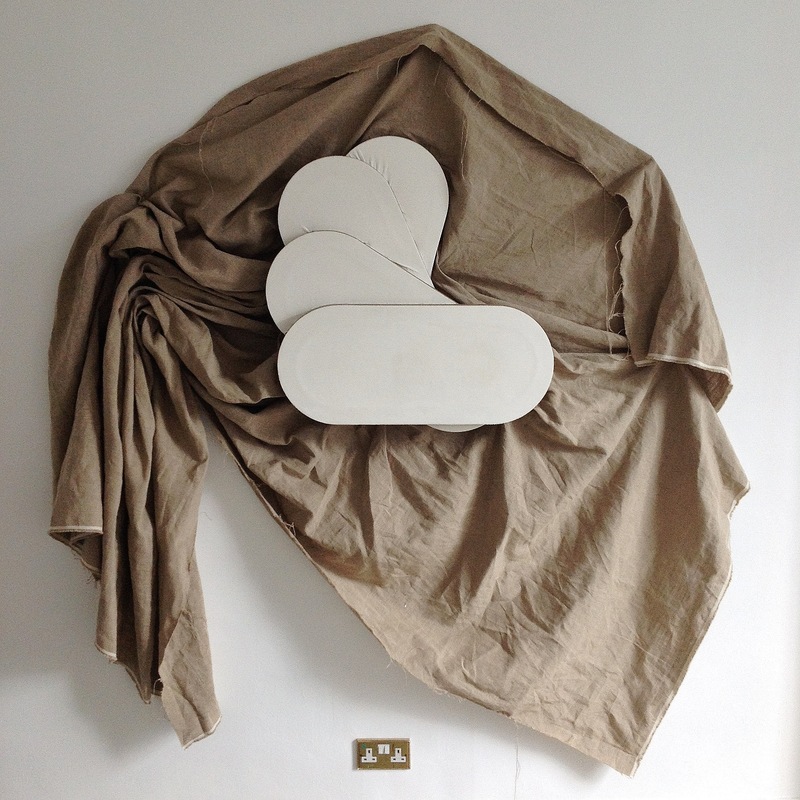 Andrea Medjesi-Jones, “Dispenser” 2016, oak support, canvas strip, fringing, acrylic and pigment. 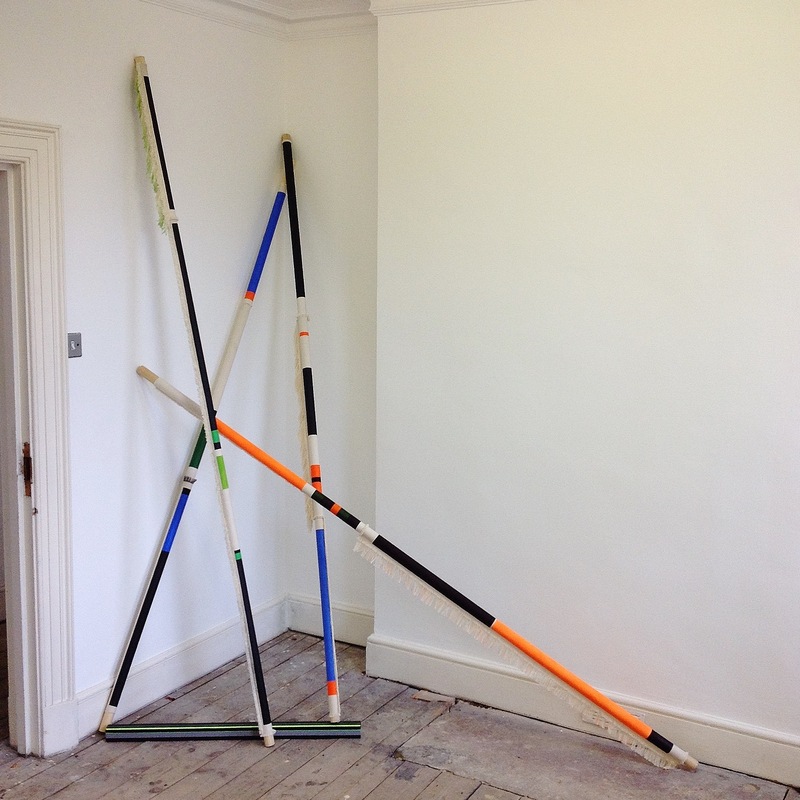 Andrea Medjesi-Jones, “Please Stand Up”, 2016, wooden poles, canvas strips, acrylic and canvas tape. Another less well known influence that can be felt in the work of Andrea Medjesi-Jones and Sophia Starling is the mostly French ‘Supports and Surfaces’ movement from the late sixties. This approach focused on processes in painting essentially involved in the materiality and objecthood of the painting surface itself. They prioritised the importance of site and the reduction of painting to bare essentials, foregrounding the structural support of the stretcher for instance or leaving canvases bare or unstretched, folded or suspended, tied off or draped. Medjesi-Jones utilises oak poles that suggest the idea of the rolled up canvas, only revealing tiny fragments of larger wholes that are bound up or wrapped round a strong supporting rod. Oddly delicate and almost decorative, fringes and frills unhinge the other snippets of what look like hard edge luminous lines and grid like structures painted on the rolled up canvases or long thin box stretcher bars. For all the hard edge rhetoric these works feel fragile and eccentric- batons containing some kind of indecipherable gridded code. 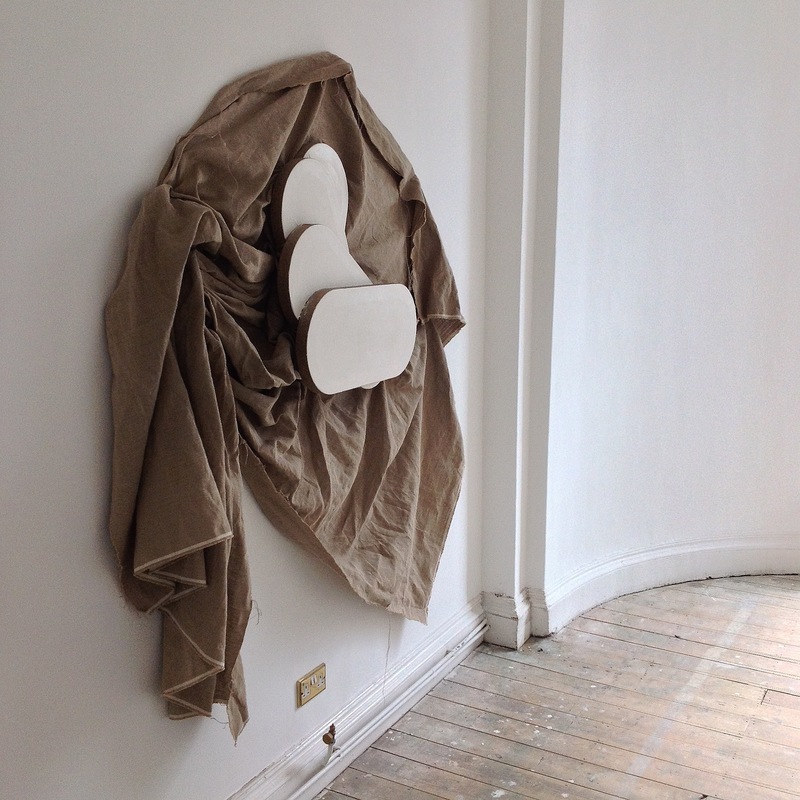 They naturally seem to colonise the domestic layouts of the townhouse come gallery rooms, lingering uneasily beside doorways or breaking out of hidden corners. 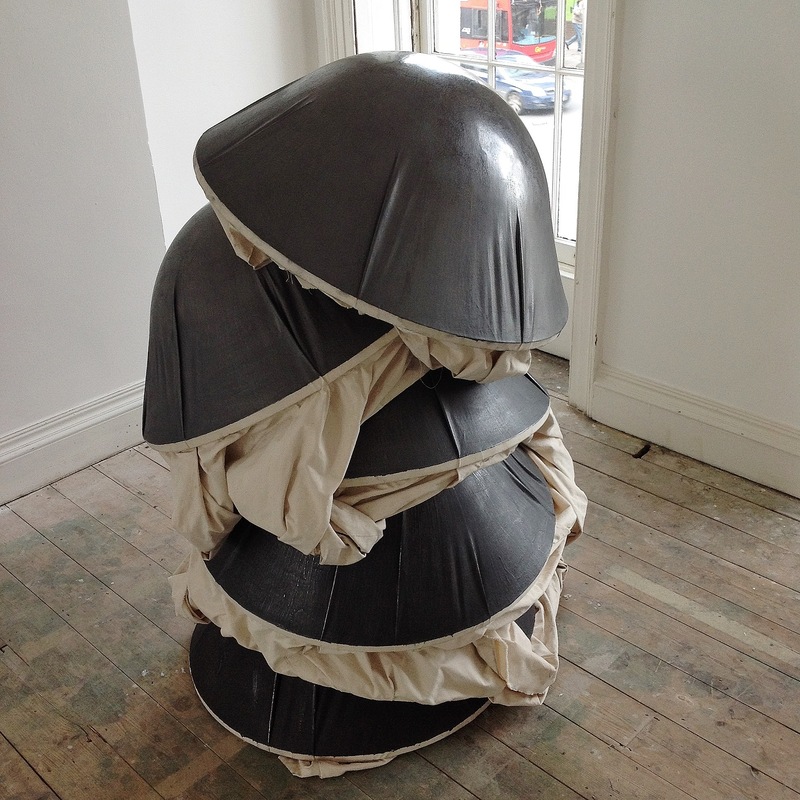 Sophia Starling, “Stack (Marble)”, marble dust and acrylic on linen. Sophia Starling, “Cluster (Silver-Black) Vertical”, 2016, graphite and acrylic on canvas, 137X 85X85cm. Kes Richardson, untitle, 2017, acrylic on canvas, 160X130cm. Kes Richardson brings the most provisional qualities of picture making to this gathering. He also foregrounds the objecthood of the surfaces he works on but very little of the obvious crafting of form remains. 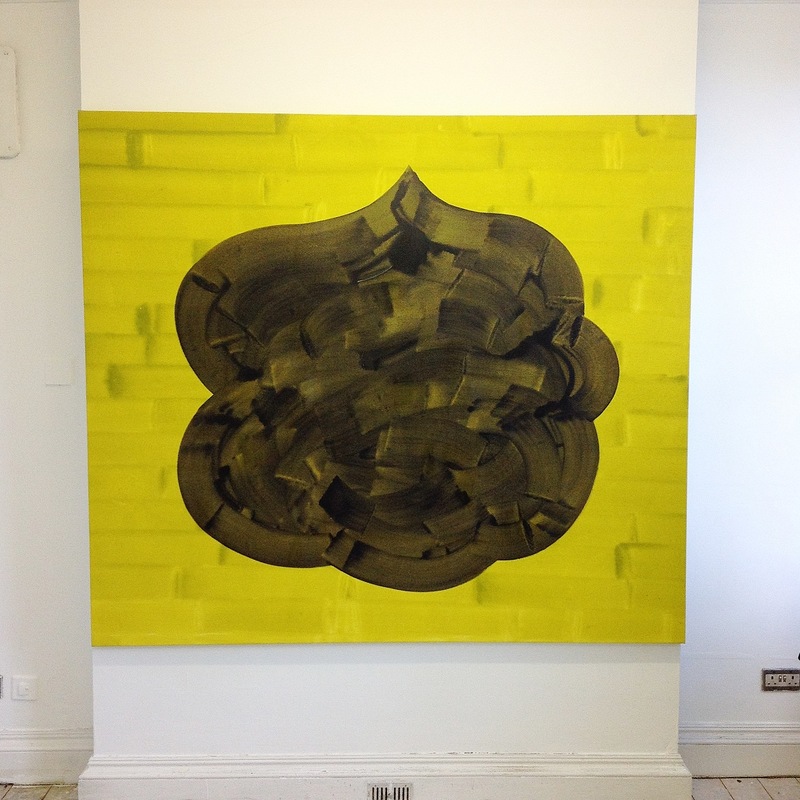 His process seems to pivot on subtractions and additions in his removing of layers of canvas. He cuts away sections of the work, leaving gestural marks and faux naive hand drawn triangles. Painted in colours reminiscent of children’s poster paints, they are set adrift in voided spaces that echo the hacked out shapes and cut away scraps. These scraps then seem to return to the surface as collaged elements, reconfigured in uncomfortable relationships with an unstable set of layers. They are like half hearted templates from oversized and violated flip charts or pads used for note making in management meetings for some bigger but forgotten plan. The best works here do not purely function as ciphers that belong to a hermetically sealed art historical continuum or an academicism of ever more subtle refinement. They function because their facture, their material qualities encourage powerful ‘strong misreadings’ that encroach upon, and throw into question, the distinct boundary lines drawn up between disciplines and the straight forward art historical narratives that protect them. These issues of tradition vs. innovation always seems especially intense in the highly contentious realm called ‘painting’. What is the difference between simply forcing a novel kind of nihilism into one’s work and attempting, by means of visual art, to extend physical and mental realms of human thought and feeling? A pill, anyone? “The image hums with the tension between a squeezing sense of claustrophobia and a strange kind of self satisfied containment and protection.” No it doesn’t is the inevitable retort that springs to mind. Colourful phraseology though, as per usual. Why do I keep thinking of condoms or Dutch caps. You see you can free associate anything you like, but is it accurate, is it true? There is/was even less of an audience for this kind of music than there was/is for modernist painting. The juxtaposition drives home the question: how is it possible to make art when there is essentially no audience at all (other than other artists, a handful of professional critics and collectors and some wealthy mostly corporate buyers)? When I studied Creative Writing at Sussex we were told that the only people who bought poetry books were other poets. There’s something positively affirmative abut forcing something – even a process or habit. The apparent nihilism is undermined by making the work in the first place, and by presenting the subsequent results in public. If some of this work is baffling or disappointing to some, it is most likely the opposite to others. I could certainly live with Mali Morris’ ‘Dark Ashbury’ on my wall. But I might otherwise choose a Kes Richardson or a Sophia Starling to unsettle me – to challenge my habitual ease with non-figurative art/imagery. Is an ‘abstract’ definition/categorisation so important? Yes and no. Today we hear that Howard Hodgkin has died. Was he an abstract artist? He discouraged the definition for his work. He was a humanist. The positive aspect of nihilism – if Nietzsche was right about notions of God. Or maybe you just couldn’t find a rhyme for defamatory? The Match hates are out again this year. March Hares. The internet has a mind of its own. How about — it looks a bit mammatory. I’m sure Pete Hoida could find a better rhyme than that. Or is it cos I’m a Tory, (not). “Howard Hodgkin is arguably one of the late 20th century’s greatest portraitists. Profound misunderstandings abound. To give him his due, Hodgkin never did claim to be abstract, though how one can interpret a few uncoordinated daubs as a non-representational portrait (or anything else) without reading the label first, I don’t know. Hodgkin’s paintings are to me almost unfailingly and indulgently simplistic, and judged as abstract art (i.e. ignoring metaphors!) are nigh-on meaningless. In my language, they lack abstract content to any significant degree. Eyewash. Like so much of modernism, you can read into Hodgkin’s simplistic works anything you care to, because they are so ambiguous. They would need to be both more complex and more specific, and of a higher order of synthesis altogether, to ACTUALLY embody to any degree the real human content Moorhouse implies. So too most of the work in the Kennington exhibition. With the probable exception of Morris’ “Dark Ashbery”, they are not abstract, not really visual; they might be non-figurative, but they adopt their slight and crude meanings from allusion and metaphor. Because I “liked” the review, I now feel obliged to say that it was the images that I really liked! I wish I had seen the show.